at Ricky’s on 3 Road. Our New Family have been attending Sunday Services and, given the opportunity, please greet them. They are just starting English lessons and will want to practice in the near future. We would also like to send out a big thank you to our volunteers, Shirley S, Marilyn S, Bev K, Marg B, Ellen T, Jennifer P, Darlene J, and Laurie F for their regular visits to the family. Please don’t forget the the need of the refugee fund in your offering as well. We know we live in interesting times. Theologian Stanley Hauerwas will address what this means for the church and how to make sense of it theologically. The theme of this year’s Laing Lectures at Regent College is ‘Theological Existence Today’. All three lectures begin at 7:30 pm and admission is free. The Synod Convention will take place May 24 to 27 at Shepherd of the Valley in Langley. Anyone can attend as a visitor. We are seeking to name a delegate. If you are interested. Please speak to Pr Christoph or Warren. 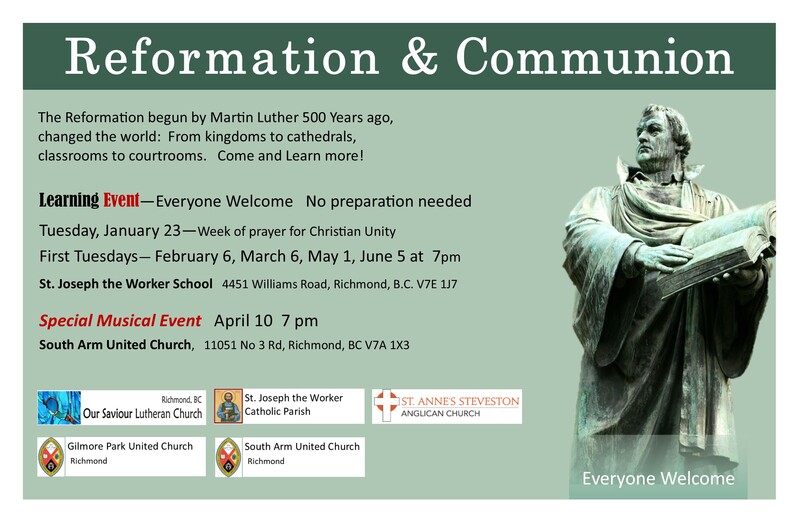 May 1 June 5 at 7:00pm at St Joseph the Worker School (4451 Williams Road, Richmond). There will be a special musical event on April 10 at 7:00pm at South Arm United Church (11051 no. 3 Rd, Richmond) See poster on bulletin board. We ask God for strength and healing for: Rose A, Bishop Marlin, Trevor B,Til and Virgie C, Christine C, Erik C, Martin C, Ian G, Laura H, Pastor Ken, Marilyn J, Marlene J, Michelle J, Kerrie M, Michael K, Brittney M, Roxanne McD, Boni R, Michael R, Ron R, Fernanda S, Margaret S, Irene S, Madeline T, Grace W, and Edita W.